10 growing pains every multi-store retailer experiences (and how to overcome them). In the process of scaling your retail business? Here are the pain points to watch out for. 1. Striking a balance between brand consistency and localization can be tricky. Running multiple stores requires balance. On one hand, you’ll need to maintain brand consistency across all your stores and provide the same great experience everywhere. But at the same time, you may also need to “localize” each store to cater to specific markets. Know what you stand for, and only hire employees who embody your brand and values. Manage all your stores and channels from a single platform. Give each store the freedom to incorporate certain elements specific to its location. Example: Anthropologie. The clothing retailer enlists local employees and artists to create unique window displays for each store. Anthropologie’s corporate headquarters provides a concept and some creative direction, but it lets each store interpret and execute its own vision. The result? Each Anthropologie store incorporates some local flavor in its window display while still adhering to the general theme the brand wants to convey. 2. Supervising multiple stores is no easy feat. Run your business in the cloud. Since cloud-based solutions don’t “live” in any one machine, they allow you to access the tools and data you need from anywhere as long as you have an internet connection. Consider hiring a retail manager who can work closely with individual store managers and employees. Have this person report to your company headquarters so he or she can keep everyone on the same page. Example: Wine Direct. This NZ-based wine retailer employs a retail manager whose job is to coordinate across different locations. “We’ve found that the physical separation of stores from HQ makes the job of keeping customer service really high and consistent that little bit harder. And that same separation makes it harder to keep staff engaged and motivated and with a feeling of central relevance to the company,” says owner Ryan Quinn. 3. You can’t be as nimble as you once were. Review your policies and processes to ensure you’re not imposing unnecessary requirements or rules. Modifying your organizational structure and giving those at the management level the autonomy to make decisions. Fostering a culture in which your customer-facing employees are empowered to make decisions based on their product and customer knowledge. 4. It’s harder to keep track of your customers. Arm yourself with a good CRM that lets you track shopper behavior. Set up a loyalty program so you can reward your best customers and treat them like VIPs. Collect — and analyze — shopper data so you can get to know them better and personalize their experiences. 5. You might end up hiring the wrong people. You can’t be in multiple locations at once, so you’ll have to make sure you leave each store in capable hands. And in addition to dealing with recruitment challenges, you’ll face training and management issues once you hire more people. Trust can also become an issue here. It’s easier to know and manage your employees when you’re running a small business, but having several stores entails dealing with workers who you may not know or trust completely. Promote from within. If you have existing employees who’ve earned your trust and are doing a tremendous job, see if they’re willing to manage your other locations or channels. Find new hires from your existing customer base, and encourage employee referrals. Start training employees for new locations at your existing stores. Allow them to learn how things are accomplished in your current stores, then let them bring that knowledge to other locations. Set the right user permissions to ensure that employees can only perform tasks assigned to them. Example: You may want to restrict sales associates from processing refunds or returns, and leave this task to your managers. This helps ensure that all returns and refunds are legit. And if you want to keep your business financials private, you could limit people’s ability to view certain types of information (e.g. supply prices, margins, etc.). 6. Inventory management becomes immensely more complex. How you manage your inventory when you go from a single store to multiple locations will change dramatically. Expect to deal with issues such as distributed warehousing, indent ordering, warehouse locations, online vs. offline inventory management, and more. Use a single platform to manage all your products, stores, and channels. This makes it easier to transfer stock and track shipments across different locations or channels. Manage your inventory in the cloud. In doing so, you’ll be able to carry out tasks like product ordering and transferring from anywhere. You can, for example, order products for store #2 even when you’re manning store #1. 7. Your finances are more complicated. Hiring a professional to handle your finances. Investing in accounting software that simplifies the financial side of your business. Integrating your point of sale system with your accounting program so financial information can flow smoothly from one system to the next. 8. You need to comply with different laws depending on where your stores are located. Check (and double-check) the laws you’ll have to comply with, and recognize that regulations may vary from one location to the next. 9. Communication issues may arise. Catch up with key individuals regularly, and set the goals and KPIs you need to achieve. 10. You’ll run into technical difficulties. Opting for a cloud-based software. This will enable you to access the tools and data you need from anywhere — which is quite powerful, especially for growing retailers. Having up-to-the minute information on how your business is doing will enable you to get a more accurate view of store performance and help you better understand your business. Ensure that your solutions can integrate with each other. You’ll want your systems to “talk” to each other and seamlessly transfer data from one program to the next, so you won’t have to worry about re-entering any information. the #1 POS for growing retailers. Are you looking for a retail management system for your growing retail business? 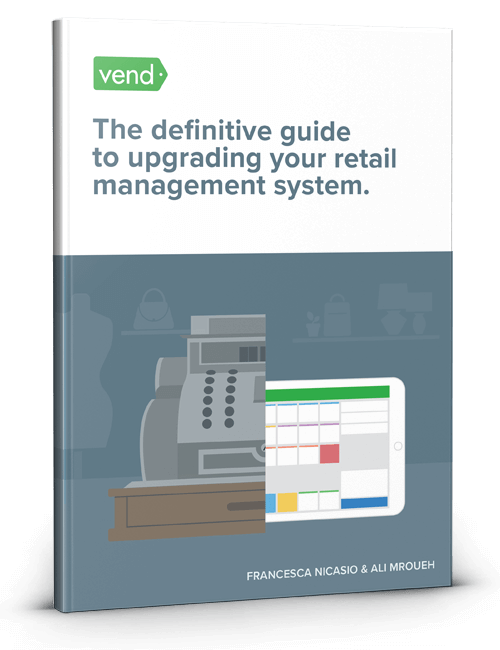 Download the Vend Guide to Upgrading Your Retail Management System. Whether you have a couple of stores or are on your way to building a retail empire, this guide will show you everything you need to know to select and deploy a new retail management system.